Vibrant, game-changing CEO Lisa Messenger shares an insightful account of her rollercoaster ride as the creator and founder of the globally popular Collective Hub, the hip magazine of inspiration for disrupters and innovators of all stripes—with bold ideas on how you can stay on track and remain true to whatever your passion may be. Whether you’re a budding entrepreneur, corporate ladder-climber, or a seasoned business owner, Daring and Disruptive is a powerful and practical guide that can help you dig deep, stay on message, and stay true to your ideas in challenging times (so if you’re thrown to the wolves, you’ll have the strength to come out leading the pack). 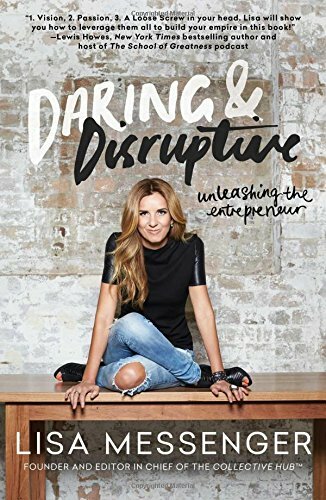 It’s the story of an inspirational Australian entrepreneur, and the rollercoaster ride she went through in creating a sustainable business. She tells of her story honestly and from the heart, clearly conveying her desire to success and making the seemingly impossible possible.